Few things are worse than wanting to straighten your hair, but not having the time to wash and blow dry it properly. Times like these help us realise the importance of owning a hair straightener, also called hair iron, and flat iron, those magical things that you plug in to get perfectly straight hair in almost no time. There are quite a few brands on the market though, like Remington, Philips, Havells, etc., and each brand has various models, so it can be quite hard to choose. Therefore, this article will discuss how you should choose a hair straightener, and also give you a list of the top 10 best hair straighteners you can buy online! They say you shouldn’t judge a book by its cover, and somehow this holds true for hair straighteners as well since almost all of them look more or less the same on the outside. However, if you look into the features and specifications we’ve mentioned below, you will realise how different each straightener can be. 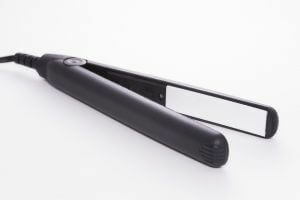 The material of the plate is an important factor you must consider before buying a hair iron. The most commonly available ones are usually ceramic plates; they are cheaper, and better for those with thin or fine hair as they reduce frizz. However, they take longer to heat and corrode over time, which leads to uneven heat distribution. There are also more expensive types of plates, and these are made of titanium. 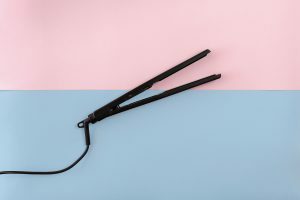 They heat up quickly, resist corrosion, and are considered to be more suitable for thick or curly hair as they can achieve higher temperatures and minimise the chances of having to go over sections of hair, again and again, to properly straighten them. The width of the plates is another aspect you should look into because different plates are made for different types of hair. Narrow plates are better for those with fine hair and short hair, as well as for those who want to carry their straightener with them while travelling as these ones are easier to fit in the bags. Hair irons with wider plates are better for those who want to use them at home as they’re less convenient to travel with. They’re also better suited for those with thick hair or long hair as they can cover more sections of the hair this way and not have to spend much time on this. 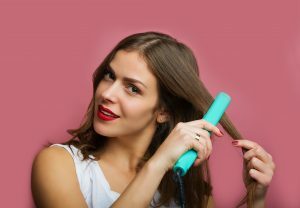 Buying a hair straightener with adjustable heat settings can be a bit more expensive, but it is definitely worth it as it would help you to keep your hair healthier, and speed up the process of straightening your hair whenever you’re in a hurry. Whether you’re using it on low settings or high settings, you must always use a heat protectant! 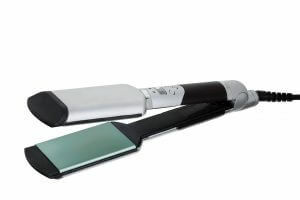 Those with fine or thin hair should look for hair irons that have lower settings to limit the amount of damage their hair has to go through, while those with thick or curly hair should choose flat irons that have higher heat settings so they do not have to repeatedly iron the same section of hair and end up damaging it. 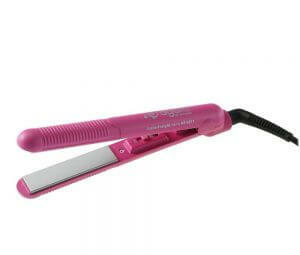 Hair irons are not only for straightening your hair, you can also use them to curl your hair. If you’re planning to use your straightener to curl your hair though, we recommend choosing a straightener with rounded edges as that will help you get more beautiful curls. Since hair straighteners can sometimes be quite an expensive investment, it’s crucial that you choose a product which comes with a warranty. Longer the warranty period, the better it is, because it makes sure that if your hair iron stops working, you don’t have to spend any money to get it fixed. 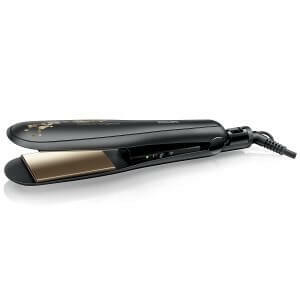 We shall now reveal our picks for the top 10 best hair straighteners you can buy online in India. Don’t forget to check for all the specifications we discussed earlier to choose the best product for yourself, and we hope you will be able to find a product on this list that meets your needs. This hair iron with wide ceramic plates is a great option for those with thick hair as it would lessen the amount of time they’d need to spend on straightening. It also comes with a 2-year warranty, so in case something happens to it, you can get it repaired or replaced for the first 24 months. On the downside though, even though it claims to add shine to your hair, it doesn’t do that at all. It also takes a while to cool down, so you would have to be careful if you’re the type who keeps things lying around. Additionally, it doesn’t have adjustable temperature, so it can be really damaging to your hair as well. Although this straightener is from a relatively unknown brand, it is an amazing, yet inexpensive product for those with long, thick hair, as it has wide ceramic plates. It also comes with adjustable temperature, and heats up to 220 degrees, so it works well for those who have trouble properly straightening their hair. However, since the plates are quite wide, this product would not be great for those who want to use their straighteners to curl their hair as well. Furthermore, you have to be careful while using this flat iron, not only because there’s no warranty, but also because the outer body can get really hot after it’s been in use for 15 minutes. 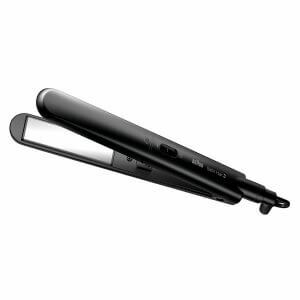 One of the few straighteners on the market with titanium plates, this product is recommended for those with thick, curly hair, who want frizz-free, soft, and straight hair. It comes with adjustable temperature, an auto-sleep feature, and a heat-resistant storage case. 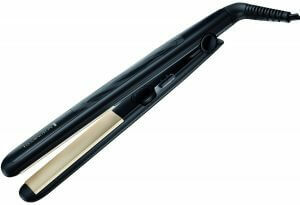 Since it has narrow plates, it can also be used to curl your hair. Despite being the most expensive product on the list though, it only comes with a 1-year warranty, so if something happens to it after that, then you would have to pay to get it repaired. Furthermore, if you have thin hair, then you could easily use a more basic straightener, and not have to spend as much money on it. If you’re looking for a hair iron that heats up in less than a minute, and gives you straight hair, without having to go over the same sections of hair again and again, then this is the one for you! It has wide ceramic plates and is recommended for those with thick, curly hair, who want to make their hair smoother and less frizzy as well. Although it comes with a 2-year warranty, it may still seem like quite an expensive product if we look into its specifications. It doesn’t have adjustable temperature, nor does it have an auto turn-off feature, so despite it’s hefty price tag, it lacks quite a few of the features that are present in higher-end models. Those looking for a considerably affordable flat iron with adjustable temperature and the auto shut-off feature will love this product. 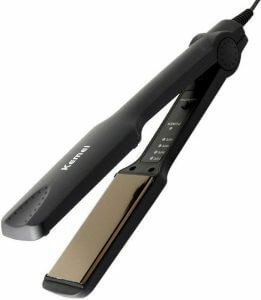 It has wide ceramic coated titanium plates to prevent frizz, so it is better for those with thick, curly, or long hair. It also comes with a 1-year warranty, so you don’t have to worry about that either. However, the outer body of the product seems to have been made with low quality plastic, which makes it pretty lightweight, but also makes its durability questionable. It is also not great for those with short hair, because the wide plates can make it difficult to work with short hair, and you might end up burning your self instead. This hair iron is one of the most basic and affordable options on the market, so if you’re a beginner, with thin, wavy hair, you should choose this product. 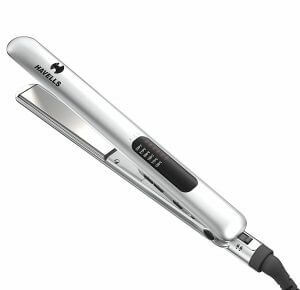 It comes with a 2 years warranty, takes 45 seconds to heat up, and since it has narrow ceramic plates, it can also be used as a curler. On the downside though, since it is quite thin, it does not work well for those with thick, curly hair, as they would need to repeatedly work on the same sections to properly straighten them. It doesn’t have the adjustable temperature feature either, so it can be quite damaging for the hair as well, so be careful if you’re using it regularly. This is the cheapest hair straightener on the list, and despite that, it comes with a two-year warranty! It is recommended for those with thin hair that isn’t too curly, as it has narrow ceramic plates which are better suited for this type of hair. It is compact and lightweight, which makes it a great option to travel with as well. Although, if you are looking for features like adjustable temperature, you would be a bit disappointed, as this flat iron lacks such features. It also doesn’t work well for thick and curly hair as it would take too long to get this hair type perfectly straight. The outer body can get pretty hot too, so it is easy to burn yourself if you’re not careful. The only other hair straightener on this list, which has titanium plates, this product is recommended for those with thick, curly hair, who want frizz-free straight hair. Since the plates are quite narrow and long, they also work well for those with thin, long hair, as they decrease the amount of time needed to straighten each section. Although it’s a bit expensive, this hair iron comes with a 2 years warranty, adjustable temperature, and an auto shut-off feature which automatically turns off the iron after 60 minutes. It heats up in 20 seconds, with temperatures ranging from 155 degrees to 230 degrees, and due to the narrow plates, it can be used as a curler as well. One of the best hair straighteners on the market, this is recommended for those who want something that is easy to travel with and does not make the hair dry and frizzy. Since it has narrow ceramic plates, it is great for those with thin hair, but the adjustable temperature feature makes it work for those with thick, curly hair as well. 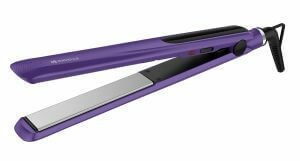 The narrow plates are also wonderful for those who want to use their straightener to curl their hair as well. Although it seems expensive, it would be a worthwhile investment as it heats up in less than 15 seconds, comes with a 3 years warranty, a manual on-off switch, an auto shut-off feature, and includes a cover to store the product. The best straightener on the market, it comes with narrow ceramic plates which make it ideal for those with thin or short hair. The highest temperature goes up to 210 degrees though, so those with thick, curly hair can use it too. 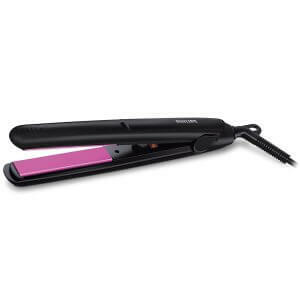 It takes 60 seconds to heat up, and you can easily get through all of your hair if you straighten it in sections. 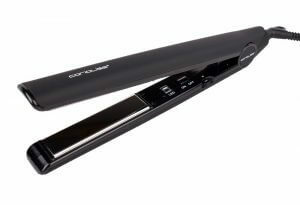 It is also one of the most affordable options available and comes with a 2 years warranty, so we recommend this to beginners, as you can use it both as a straightener, as well as a curler. Since it is quite lightweight and small, it also great for those who need a hair iron which can fit in their luggage, to take with them while travelling. If you learn how to use a hair iron, then you won’t have to spend hours at the salon every time you want to get your hair straightened. There are various options available on the market, each targeted at a certain type of user, so choose the one that best suits your needs, as well as your budget. We hope after reading this article you feel confident enough to differentiate between different types of hair irons, and how you can choose a flat iron to meet your specific requirements. We also hope that our list of top 10 best hair straighteners made it even easier for you to choose and get your hands one!